The horrors of the dog meat trade and dog farms have been back in the news with dog meat on the menu at some South Korean restaurants close to the Pyeongchang Olympic games. Although most news regarding the sale and consumption of dog meat focuses on Asian countries, I was surprised (and horrified) to learn that dog meat can be legally consumed (but not sold) in 44 states! The only states that specifically ban dog meat are Georgia, Michigan, California, Hawaii, New York and Virginia. Clearly, there’s still a lot to do before we live in a world where dogs aren’t cruelly farmed and served for dinner. How Far Have Dog Meat Farms and the Dog Meat Trade Come in the Past Several Years? Organizations and celebrities are raising awareness about ending the dog meat trade, but how far do we still have to go? Photography ©gaikphotos | Thinkstock. On the other hand, there is a shifting and awakening conversation about ending the dog meat trade. Canadian Olympic figure skater Meagan Duhamel shares her home with a South Korean dog meat rescue named Moo-tae. Duhamel, American Olympic skier Gus Kenworthy and Team USA Olympic snowboarder Lindsey Jacobellis appeared in a recent public service announcement for #EndDogMeat (watch it on YouTube) to bring attention to this issue. Kenworthy adopted a dog while competing at the Sochi Olympic Games in Russia and was a vocal advocate for dogs there. In Pyeongchang, Kenworthy added another dog to his family. 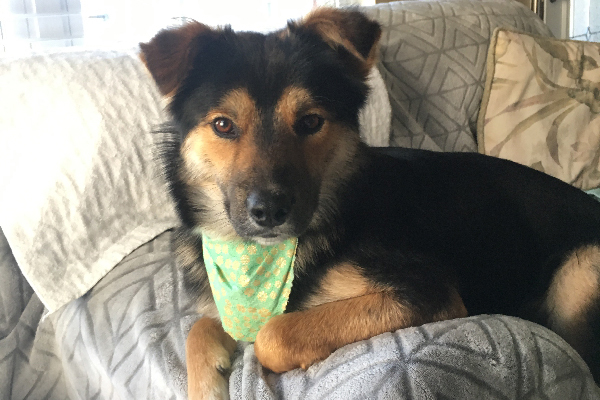 “For our little guy, Beemo, the dog meat trade ordeal is over, but it’s horrifying to think that so many dogs just like them are still suffering this fate across South Korea,” Kenworthy tells the Humane Society International. The three Olympians partnered with Humane Society International, which leads efforts to combat the dog meat trade around the world. Humane Society International’s innovative work on the issue isn’t just about caring for dogs who were rescued from meat farms, but also working with dog meat farmers to find more humane ways of financially sustaining their families by supporting them transitioning into other businesses, “such as water delivery or chili pepper farming. The Gyeonggi-do farmer, who has raised dogs for human consumption for 10 years, will now grow mushrooms,” the Humane Society International reports. Humane Society International says they have managed to close 10 dog meat farms in South Korea so far, and more than 1,200 dogs have found homes in the US, Canada and UK as a result of their work. The dog meat trade continues in Asia, including South Korea, where dogs are commercially farmed. There are an estimated more than 17,000 dog meat farms active in South Korea. Humane Society International reports that an estimated 30 million dogs are killed each year for their meat. Dogs have been eaten for centuries, which also makes this a culturally complicated and sensitive issue. ESPN says that a recent survey in South Korea found that “58 percent of respondents do not eat dog meat because they consider dogs to be pets,” which reflects a shifting cultural norm away from consuming dog meat. Public adoptions of dogs by Olympic athletes and others also helps to shift public opinion in South Korea that dogs bred for meat are somehow different or less desirable than dogs bred and kept as pets in the country. The Yulin Lychee and Dog Meat Festival occurs in China each June around the summer solstice and has become a very public face of the dog meat debate. An estimated 10,000 dogs are killed to supply dog meat for this festival every year. In fact, dogs are violently and publicly slaughtered at this festival. Some people believe the more violent the dog’s death, the better the meat will be. Dogs bound for slaughter at Yulin are crammed together in wire cages on trucks. Conditions are so poor that some of the dogs suffocate or die of disease on their way to the festival. Those that survive the journey get beaten to death with metal poles. Unlike in South Korea, most of these dogs weren’t farmed for their meat. Most dogs eaten at the Yulin Festival are stray street dogs, or even worse, dogs stolen from loving families. Many dogs who are slaughtered are still wearing their collars — indicating that they belong to families. 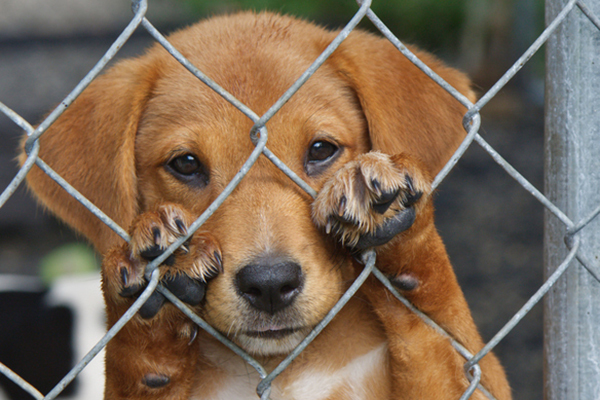 How Can You Help End the Dog Meat Trade? 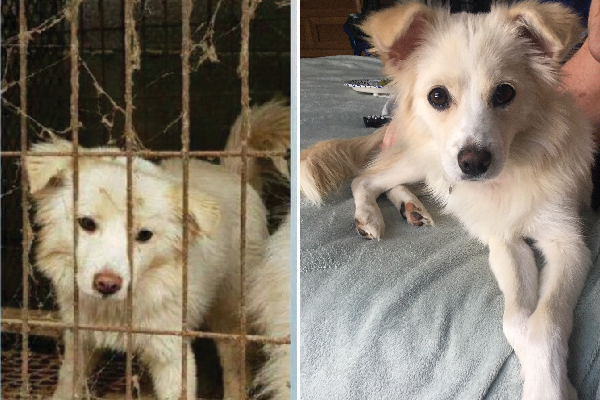 Dog meat trade survivor Kiwi before and after. Photography courtesy Stephanie Bonham. These volunteers will also bring dogs back with them. These dogs are then transported to cities in the United States, France, Ireland and Canada. “The dogs we are taking are dogs that already have designated rescues to help find good homes for them in their new countries,” Bonham explains. One of Stephanie’s dog meat trade rescues, Zeus. Photography courtesy Stephanie Bonham. Rescue: Want to bring a dog meat farm rescue home? There are many rescue organizations like Slaughterhouse Survivors who are bringing dogs from dog meat farms back to the United States and Canada for adoption, including Korean K9 Rescue, Free Korean Dogs and Soi Dog. Thumbnail: Photography by SOMMAI / Shutterstock. The post Ending the Dog Meat Trade: How Far We’ve Come and How Far We Have Left to Go appeared first on Dogster.